Wal-Mart to Sell $99 4GB iPhone? Boy Genius Report first broke the story back in October that Apple would begin selling the iPhone at Wal-Marts. The actual date of release appears to be December 28th. 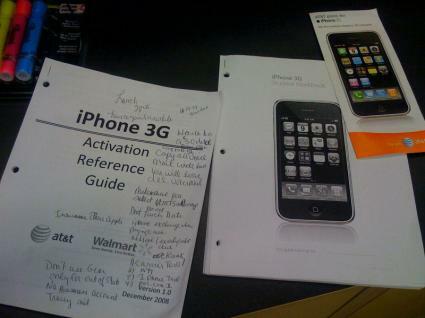 Wal-Mart employees are already receiving training on iPhone activation (see photo above). Today, a new report from Boy Genius Report claims that Apple may be reintroducing the 4GB iPhone to be sold at Wal-Mart for only $99 with a two year contract. The site is not entirely confident about the report, so suggests this possibility should be taken with caution. When Apple originally introduced the iPhone, it came in 4GB and 8GB models. Only a couple of months later, Apple discontinued the 4GB model altogether and dropped the price of the 8GB model. Apple currently sells an 8GB ($199) and 16GB ($299) iPhone with 2 year contract. Aggressive $99 pricing for an entry level iPhone would correlate with comments made by Steve Jobs in October. Jobs said that they needed to continue to be aware of a possible "price umbrella" below the iPhone that competitors may take advantage of. Analysts have suggested that Apple could feasibly sell the iPhone for $99.